This cookbook contains over 250 recipe options for vegetarians or those wanting to consume less meat. It is not a vegan cookbook; some of the recipes do contain cheese, honey, eggs, etc., but there are many vegan-friendly recipes included. The cookbook includes basic training on how to prepare and use many of the ingredients contained in the cookbook. This is a great cookbook for the soy lover—many of the recipes include tofu or other soy based ingredients. There are also recipes that focus on beans and grains. And of course there are many wonderful salad and soup recipes that will help you get more than your daily intake of vegetables. Some of their twists on classic recipes are intriguing. For example, in the dessert section you will find a recipe for “Gold Chip Cookies”, a healthier spin on chocolate-chip cookies. 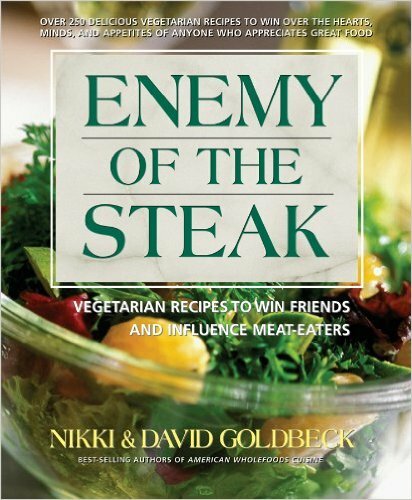 So if you are interested in eating less meat then this just might be the cookbook to get you started. You are guaranteed to find a least a few treasured recipes and probably more. Enjoy your meatless venture!